I am so sorry it is quite late, but here is my review of the musical An American in Paris in Paris, which was my prior purpose of my Paris trip. The base is the famous Gene Kelly's film in the 50's, used Gershwin's music, specially the last number An American in Paris, which is the title of the film also fantastic long ballet scene. Finally, it became the stage version with professional ballet dancers!! Leslie Caron who played the heroine Lise was also a ballet dancer, so of course we expect a genuine ballet dancing in the stage version. However, it is very rare to find a person who can dance ballet like a principle dancer, and act and sing. But it is a masterpiece musical, we want to see the beautiful ballet in the stage version too! The gorgeous cast made this musical a massive success. The lead couples are from the famous major ballet companies. Robert Fairchild who play Jerry is a principal dancer from New York City Ballet. They are genuine dancers!!! ....on the other hand, I was a bit worried, those dancers can sing....? Yes they can!!! They were fantastic musical actors, who can dance and sing. Especially, Fairchild was an amazing singer. Leanne Cope who is from Royal Ballet and played Lise were so elegant. I watched the film a long long time ago, so I forgot the story. But according to my friend who watched the stage together and remembered the film, Lise's character was a bit changed from the film. 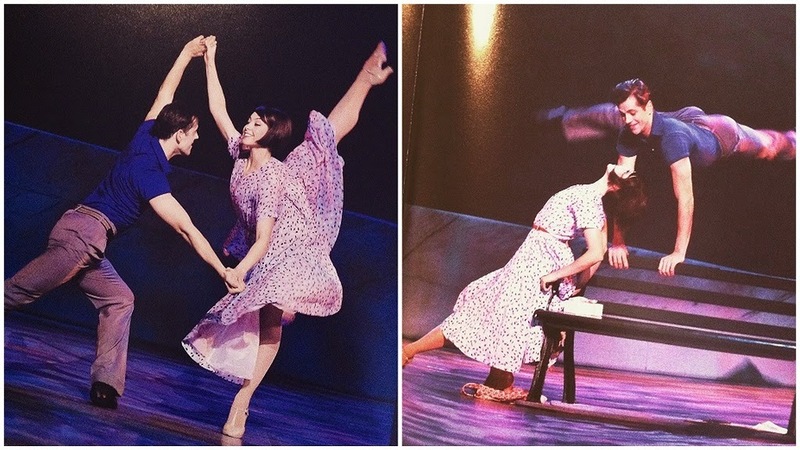 In the stage version, Lise is elegant, graceful, just like a prima ballerina. Another reason of the success of this musical was the director and choreographer, Christopher Wheeldon. He is a hot choreographer in the ballet world, his work "Alice's Adventures in Wonderland" for Royal Ballet was sensational. In the beginning of his career, his works were more contemporary, however, his "Alice" was very entertaining and made a great success. So, I couldn't help expecting his another great job! His choreography was really ballet-ish dancing, (Of course, he is a ballet choreographer), and dancers are professional ballet dancers so that dance scenes were really high quality. Not only those lead couples, ensembles are also dancers who experienced ballet. The last ballet scene was a masterpiece. It satisfies dance musical lovers for sure! Of course, not only ballet scene, there were a tap numbers and comical musical numbers.... it really is an enjoyable musical. This production finished performance in Paris, and is in preparation for Broadway. This musical received a standing ovation from the whole theatre of Parisien who usually don't fancy musicals. I asuure that it will be successful in Broadway, the best place of musicals.